Welcome to issue 51 and it is a great issue, full of fabulous projects for you to try. First of all we want to tell you about your FREE gift – the Poppy Plaque! It is a gorgeous sentiment plaque decked with glorious florals and it also has a ‘With Love” sentiment as well. Another winner! 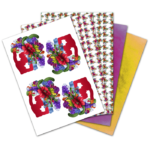 We have included some pretty papers in the centre of the magazine and you can also download a lovely set of Charisma images for you to cut into. We also feature some of the dies in the Vintage Botanicals Collection – the Foxglove and Lily. These projects will show you how to make eye-catching cards using this new dimensional concept. 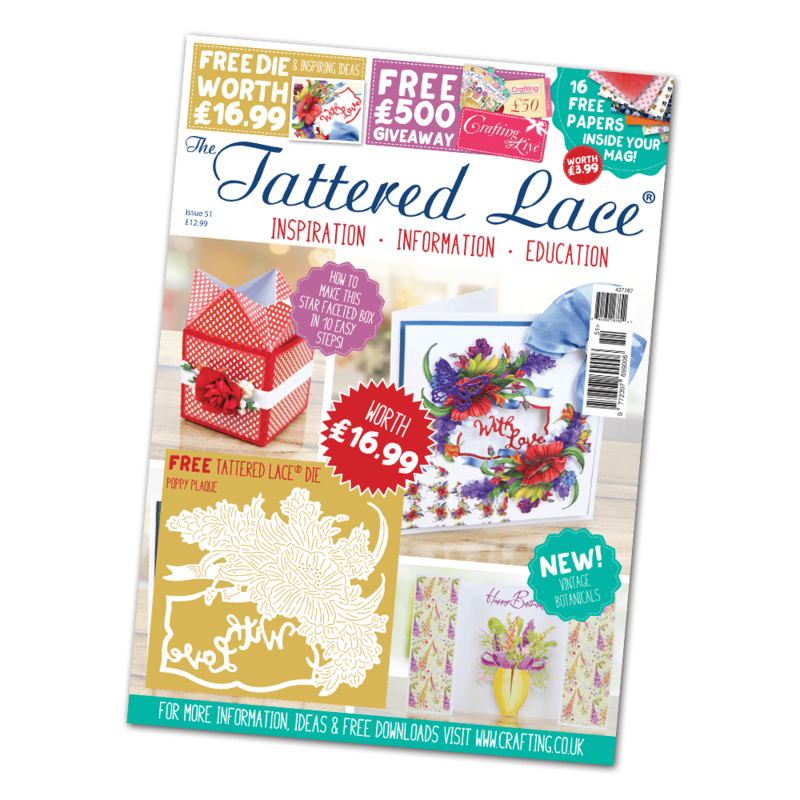 Talking of eye-catching the Pearl Edge Square and Rectangle dies really are the epitome of Tattered Lace, different, elegant and easy to use. Who doesn’t love a handbag, so the very stylish Paris and Milan handbag die sets are sure to make you very happy indeed! Each of them has a finished handbag and a card to go with. We also feature the striking Sweet Hummingbird die in this issue, it really is beautiful. For pure sweetness and the ‘Awwww Factor’ you must try the Playful Pups die set. There is more, a glamorous Bride and Groom and a very cute Effie the Elephant. As you would expect, the regular goodies feature in the magazine too. We hope you enjoy the inspiration, education and information and carry on crafting!